Applications include speech recognition, acoustic echo cancellation, and automotive “hands-free” audio input systems. ADT Acoustic Beamformer is available on the above Platforms: Other configurations are available upon request. Contact sales@adaptivedigital.com for Linux specifications. The Adaptive Digital Acoustic Beamformer improves the signal to noise ratio of speech signals by coherently summing signals obtained from a linearly-spaced microphone array. Applications include speech recognition, acoustic echo cancellation, and automotive “hands-free” audio input systems. 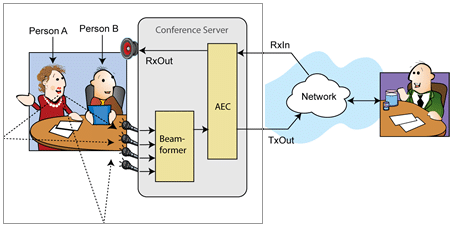 The diagram above shows a communication system in which beamforming can be used. On the right side of the figure, a person is speaking to Person A and Person B, who are in the same room. Person A and Person B are communicating hands-free. Notice that Person A’s speech has a direct path to the set of four microphones as well as an indirect path to these microphones. The beamforming algorithm causes the microphone gain to be maximum in the direction of Person A while she is speaking. By increasing the gain in that direction while reducing the gain in the direction of the reflective paths, we increase the signal-to-interferer ration, which reduces the reverb effect. Similarly, but not show, this technique improves the signal to noise ratio because background noise tends to come from all directions, not just from the direction of the desired speech. Although Adaptive Digital’s beamforming algorithm provides user-programmable microphone spacing, it is recommended that the microphones be closely spaced. The recommended spacing between adjacent microphones should be less than 10 centimeters. Furthermore, all microphones must be placed linearly and with equal spacing between them. Care should be taken to ensure that analog circuitry and analog to digital converters for all microphones be designed with tight tolerances in order to provide for a minimum difference in gain, delay, frequency, and phase characteristics between the microphones.